HomeMaccaferri India registered for the 10th Annual Conference on “Railways in India” in New Delhi. 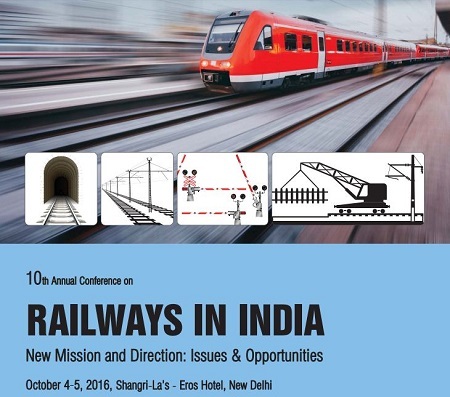 Maccaferri India registered for the 10th Annual Conference on “Railways in India” in New Delhi. Maccaferri’s devotion to the environmental cause is reflected in its sustainable solution, including road and railway infrastructure systems discussed at the 10th Annual Railway Conference in New Delhi. seem to be as far apart as black and white. Still, with its highest technological developments, Maccaferri manages to marry the two concepts together. High-quality materials are used by a team of well practiced civil engineers and designers to develop road and railway transportation infrastructure solutions; sustainable in essence so that Maccaferri may play its part in reducing the human carbon footprint and in improving rail infrastructure. Recently, Maccaferri partook at the 6th Asian Mining Congress, where Maccaferri showcased its gabion based solutions. Also, Maccaferri held two technical sessions in which it presented a range of systems that are related to River Training works, Erosion control, and Pavement Stabilisation. Part of the sessions included a discussion of the Konkan Railway project for which Maccaferri provided Gabion walls with a stepped rear face. The 10th annual Conference on “Railways in India” in New Delhi provided Maccaferri with a platform on which to showcase its newest sustainable solutions relevant to the railway sector. The conference has been organized by India Infrastructure Publishing, the leading provider of information on the infrastructure sectors via magazines, newsletters, reports and meetings. The mission of this conference was to highlight the recent initiatives of Indian Railways, examine the potential new opportunities and discuss the relevant key issues and concerns. The conference also showcased unique technologies and the best practices. The primary goal for Maccaferri at this event was to promote its products and solutions, relevant for the railway infrastructure sector. Most importantly, Maccaferri India’s vice-president, Ms. Minimol Korulla held a speech about slope stabilization, track bed stabilization, and rockfall protection. Ms. Korulla emphasized Maccaferri’s utmost devotion to the cause of sustainability i.e. To promote solutions that are sustainable in nature, easy to install and that are cost efficient. For more technical information about the Konkan Railway project, download our Case History. For more general information, please contact us.